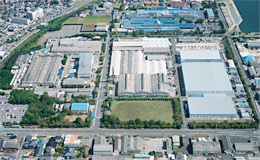 CoorsTek Nagasaki Corporation manufactures a wide variety of products ranging from synthetic quartz glass materials to different kinds of heat-resistant materials. Our Synthetic Quartz Division, which takes pride in its state-of-the-art facility, manufactures large-scale photomask substratesa necessary component in the production of large, high-definition liquid crystal displays, and LSI photomask substrates, which are used in the transfer process of circuit patterns on semiconductors. With these products, we contribute to the realization of high-resolution patterning techniques. In addition, we use our unique slip casting technology to manufacture products in small sizes to large sizes and in complex shapes. These products are employed in many different fields as heat resistant parts.